What About Those Small Electronics? Our lives are made simpler and perhaps more entertaining each day with the variety of small electronics available. Electronics such as cell phones, IPods, MP3 players, eBook readers, and handheld video games (just to name a few) can certainly cause additional clutter in your home. How can you store all your devices along with their cords and manuals? There are a multitude of ideas to choose from. 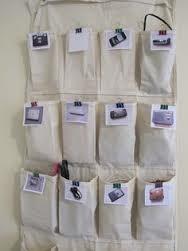 But follow some of these basic guidelines and they will help make organizing these gadgets even easier. Purchase “clear” plastic shoe boxes from the dollar store. They probably will really cost you a dollar. Put each electronic device, along with their cords and manuals, in each box. Label the outside of the box identifying what electronic is inside. You could even mark on the label the type battery used and how many are needed to run the device. Stack these boxes for easy storage and access. Purchase a plastic sweater box from The Container Store or Rubbermaid. Take your electronic devices, along with cords and manuals, and place individually in a Ziploc Bag. Label the outside of the bag what the contents contain … as well as the type of battery used to run the device and how many are needed. Stand the Ziploc bags in your sweater box alphabetically. It will be very easy to locate them when needed. Purchase an “over the door” shoe hanger to place your electronics and cords in. The only down fall of this method is that you probably won’t be able to fit the manuals. Some might fit but those larger manuals will not. As I blogged a couple of prior blog posts, be sure to label all charging and accessory cords with small labels or purchase a handy dandy label maker … not to add to your electronic pile! Consider where your External Hard Drive is stored as well as your USBs. Be sure they are safely stored in a plastic box or similar to avoid damaging them. So consider which option would work for your family and begin the organizing process. Having all your electronic devices in one area will surely help when you are in need of them.